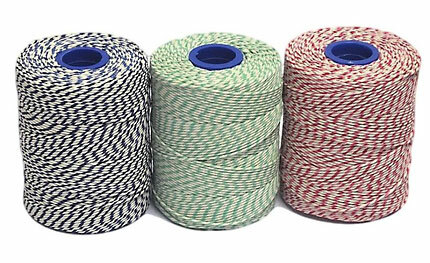 James Lever are manufacturers and suppliers of viscose/rayon twine, which is a thin multi-purpose twine ideal for use in meat preparation and is particularly popular amongst butchers. Our butcher's twines are produced from the finest quality rayon yarn, made from continuous filaments giving the twines their high strength. All our rayon butcher's twines are made to conform with the relevant Food Safety Regulations and are certified as safe for food use. In addition to the standard plain white we can offer these cooking twines with a red, green or blue fleck and also in tri-colour red, white and blue. Our rayon twines come on 500g spools as standard, labelled Everlasto brand and shrink wrapped. Please see the table below for approximate break strains and runnages. James Lever and Sons are UK manufacturers and suppliers of a large range of quality twines under their brand Everlasto. These include garden twines, butchers twines, household twines, packaging twines and decorative twines. James Lever use both natural and synthetic yarns to produce natural cotton string, coloured string, brown jute string, sisal twine, viscose twine, rayon twine, polypropylene twine and polyester twine. The twines come as either a ball or on a spool, labelled Everlasto brand and shrink wrapped. James Lever can also manufacture/package twines to the specific requirements of customers including own brand labelling.